The MSA 2050 SAN delivers flexible, high availability, extremely scalable and performance-driven storage for the most demanding applications. Whether it be consolidation or virtualization, remote office deployments, and snapshot or archive repositories, the MSA 2050 SAN model reduces bottlenecks as a completely adaptable storage solution! Designed to be a highly scalable and low cost application acceleration storage device, the HP MSA 2050 SAN is the industry favorite for small business data storage. 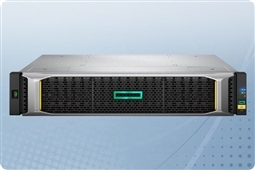 Sporting flexible storage controller flexibility, the HP 2050 can facilitate connections to Fibre Channel, iSCSI, and SAS all in one device. Simple to deploy stacking also allows up to 7 additional expansion drive enclosures to be added, increasing capacity up to 960TB. MSA 2050 SAN storage devices also take software and management features to the next level with thin provisioning, snapshots (up to 512), volume copy, space reclamation and more built into every device! Every Aventis Systems custom HPE MSA 2050 system comes with a standard 3 years warranty with upgrades to NBD and Extended warranty terms available. Have product questions? Please use our Live Chat for a quick response, call us at 1.855.AVENTIS (283.6847) or email us at Sales@AventisSystems.com. Shop below today and bring more flexibility and features to your business storage with the HP StorageWorks MSA 2050! HP MSA 2050 SAN LFF Storage, 12 x SAS or SAS SSD 3.5"
HP MSA 2050 SAN LFF Storage, 6 x SAS or SAS SSD 3.5"
HP MSA 2050 SAN SFF Storage, 24 x SAS or SAS SSD 2.5"
HP MSA 2050 SAN SFF Storage, 12 x SAS or SAS SSD 2.5"